Let us handhold you and your little one to better prepare for your very first unique Babies On Board experience. 1) The baby steps you want to take after your pregnancy: The Xtend Barre Babies On Board workout is designed exclusively for new mums. 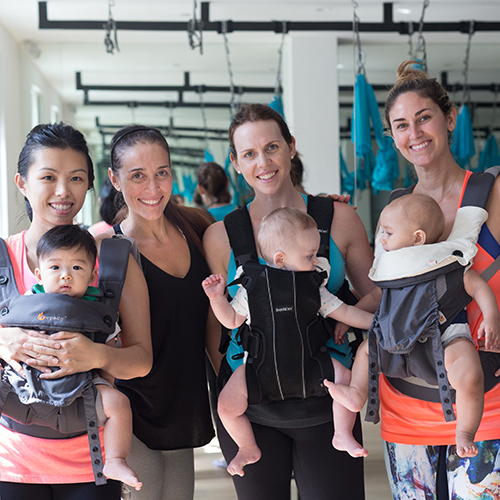 Our instructors are trained to modify the exercises and take into account your postnatal needs including: Pelvic floor and lower back strengthening, as well as muscle separation and C-section recovery. The pace of the class is much slower than a regular Xtend Barre class but by carrying the weight of baby with you while working the barre moves, you definitely will be boosting your heart rate and core strength as you sculpt your body! 2) A routine that your baby will love being a part of: During the first half of the class, your baby will be snuggling up in the carrier while you warm up with a pair of light hand weights and move on to the barre for a series of classic ballet moves like plie, pulse, curtsy lunge, bicep curls, tricep press and tendu. Not only for mum, the class is playtime for the babies as well! Babies love looking at themselves in the mirror while mummies are working out! 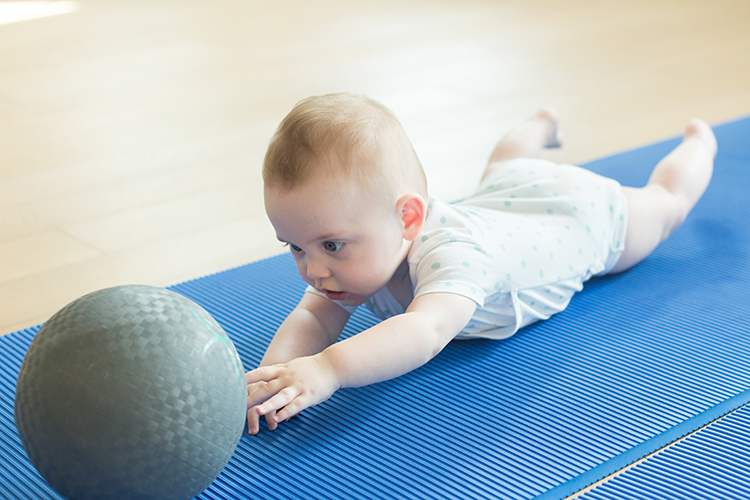 The second half of the class, mums and babies will do exercises together on a mat. Word has it that they love crawling around, playing with the ball, and sometimes talking to other babies! How about giving your baby a little kiss on the forehead in between push-ups? 3) A dedicated space: If your baby is feeling uncomfortable at any point during class, you can just step out to attend to baby and later rejoin the class without feeling disruptive. Often after the class, mums sit down and chat about their maternal journeys while feeding their babies or simply let their babies play with each other. 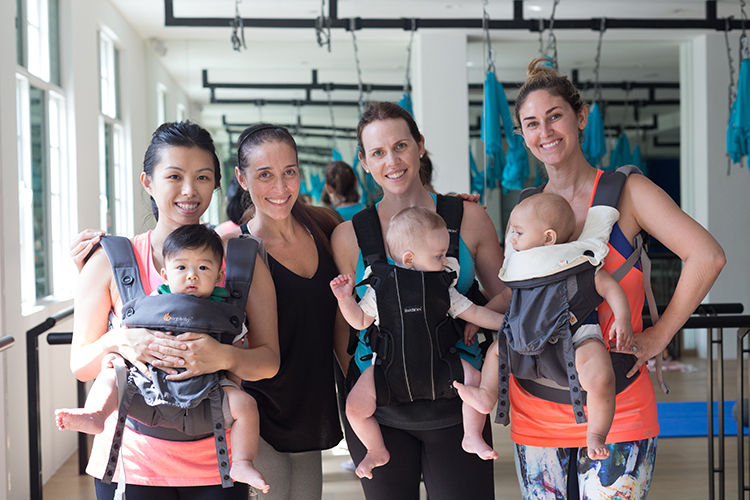 4) The class is open to all mums with babies between 3 to 12 months, under 10kg. The baby should have sufficient strength to hold his/her head up and sit comfortably in a baby carrier after 3 months. To ensure that the carrier and baby stay in place while you are moving about in class, you will need to bring your own sturdy clipped-on baby carrier and not a fabric sling. A pair of non-slip socks is also mandatory for your barre class! 5) What else to bring? Anything else you think your baby needs: His/her favourite toy, milk bottle, towel or blanket. Most of the babies fall asleep or get hungry right after class, so do be prepared to feed them! Park your baby stroller at the waiting area and you both are ready to be on board! Grab your class pass here and head over to our schedule to book your class!